There are a thousand garage bands in a thousand small towns like Binghamton. This means the number of scruffy-haired, Converse-shoed rock star wannabe's saving their lawn-mowing money for new amps, new drum heads, more hardware to record just the right sound is probably astronomical. The number of these hopeful kids who stick together without breaking up for all their middle school and high school years, who keep writing new tunes, scribbling out new lyrics in the midst of chem labs, jazz band, fast food jobs, college apps? The five guys who make up Where's Ulysses work against the odds. 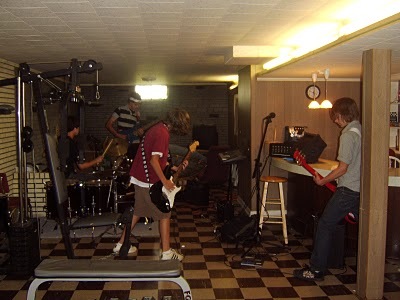 For six years, they've made music, scribbled lyrics, tried out a plethora of instruments, fought creative differences, dreamed about projects, booked shows, brainstormed not just one, but two band names, together. Some marriages don't even last that long. Not a garage band in the purest sense, more like a basement / backyard / bedroom / garage band. Their first show (at that time playing under the moniker Dot Rama) not a single one of them had a driver's license -- nor facial hair, probably. 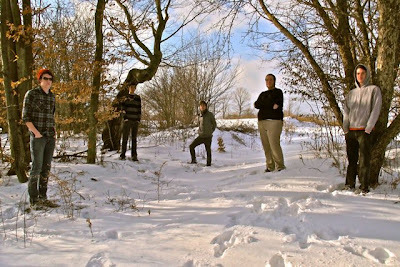 We never knew then if the venues would provide heat, indoor plumbing or decent acoustics. But the guys kept writing, imagining, listening to new music, bumming ideas off each other instead of cigarettes. In the frozen week between Christmas 2010 and New Year's 2011, they loaded up their parents' vans with food, water, scarves, hats, guitars, drums, amps, a bunch of partial songs and one banjo, drove to a cabin in the backwoods of our backwater town, eyes set like flint to record an album. Technically, a seven track EP. None of us were sure they'd keep themselves warm and fed for a week, let alone be able to make anything out of all that musical ideation. We watched them skid out onto the snowy highway, smiling at the image of them living on only peanut-butter & jelly, Mountain Dew, woodstove heat and no indoor plumbing. Come to find out the boys can write. And play. And mix. And book shows. I'm not saying we ever doubted them, but when its your own kid, well, you kind of want to season your opinions with several grains of salt. They went into that cabin only half-made and they emerged, blinking into the sun glaring off icy pond, with a record of life as they know it at seventeen. Eighteen. Nineteen. They wrote the lyrics of the in-between space in life. Each one of them full of the wild, but not yet certain where to step. And while I'm no music expert, I'm smart enough to notice a few qualities in The Wilderness EP that sets it apart as something to notice. For one thing, there not a hint of artificial in the entire project. From the crusty snow in the cover art to the youthful earnestness in the "gang vocals", there is an organic real-ness to the recording that I love. Really, even if it wasn't my kids on there, I'd want to sing along. Each song has it's own quality, it's own unique contribution to the whole. Kind of like the guys themselves. From the harder rock backbeat in "This Side of Paradise" to the pop-hooks of "Grey Hound" to the gentle guitar picking and banjo cameo on the finale, "Hunting Song". Perhaps what I love most about the album is all the poetic surprises that sort of hold down, like tent pegs, a canopy of unashamedly youthful sound, demonstrating a kind of "old soul" persona. Even then, the authenticity shines through with irony that's so subtle, it comes across as wistful instead of jaded. This ability to wrap the abstract fears accumulated while growing up in the age of climate change and technology overload into something as concrete as a benediction for the ubiquitous power lines knocks me out every time I listen. The instinct -- learned or reflex -- to remind us of the intangible longings we've all kept, no matter how old we've gotten, into tangible images informed by real place and time is a pretty good indicator that Where's Ulysses has only just begun to invite us into their artistic journey. 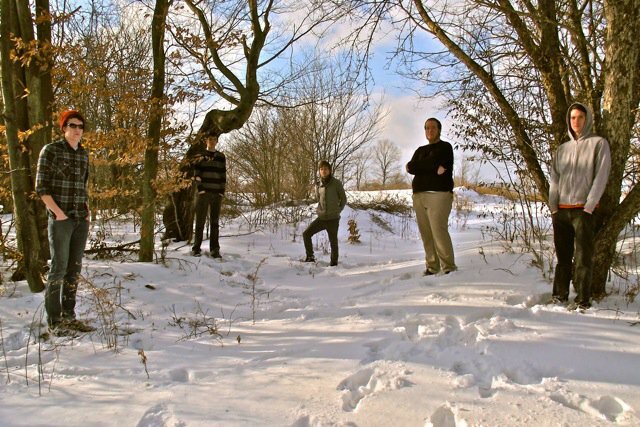 In this case, a group of boys-becoming-men huddled in the wintry woods, daring to hope for bigger and better adventures. 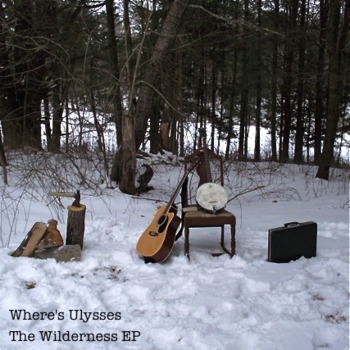 Leaning into the hint of journey and exploration in their name, I hope Where's Ulysses has only just begun to find themselves.